My parents in law love eating like the rest of us in the family. They also love the restaurants at Bandra, where we stay. 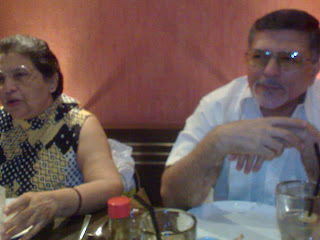 So they took the wife and me out for dinner on Navroze to 5 Spice. 5 Spice is a Chinese restaurant just opposite our house. It is quite popular as the food is good, the ambience is nice and the portions are HUGE! In fact it is so popular that we often see crowds outside it, waiting to be seated. We have been there quite a few times before and have enjoyed it. We ordered a burnt chilly fried rice. This is a dish which both my in laws and I are quite fond of. In fact this seemed to be the speciality here as we saw most people around us order the same. This is a uniquely Indian take on Chinese fried rice which has fried red chillies and deep fried caramelised onion in it. Unfortunately I had left the camera behind. The pictures that I took with my mobile do not do justice to it. I also ordered something called red dragon chicken as my in laws are very fond of spicy food. I must say that the dish did not live up to its fiery promise. It was red in colour, but not spicy. The chicken was very tender though. 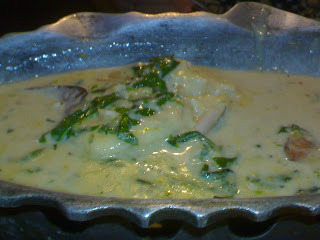 The wife had a Green Thai curry with fish. This was very well flavoured and tasty. They served it in a quaint, fish shaped tray. They make it really well. In fact I have even had their vegetarian version in the past and liked it. I was a bit hungry at the end so I ordered a chocolate chip cookie dessert. It was awesome. 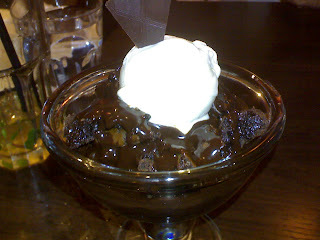 It had cookies, brownies, chocolate chips, vanilla ice cream, chocolate sauce, coffee essence – it was the Incredible Hulk of desserts and I am embarrassed to say that even I struggled to finish it. All in all we had a great dinner. A dinner which renewed my in laws’ faith in the restaurants of Bandra. A dinner which set the tone for the year ahead. 5 Spice has arguably the best Chinese food in Bombay. Total VFM place.